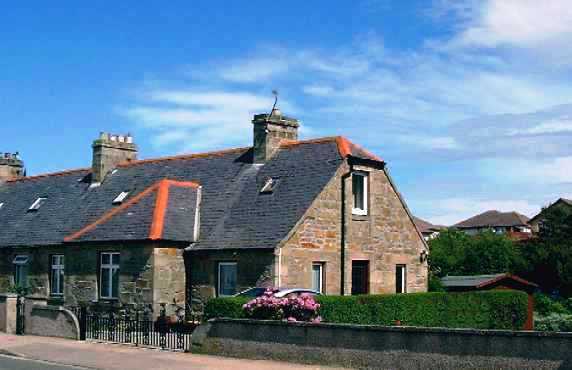 Holiday cottage Burghead, Elgin, Moray, scotland - self catering accommodation. Taigh-togalach is a traditional 3 bedroom semi-detached holiday cottage offering comfortable self-catering accommodation for up to six people in the coastal fishing village of Burghead, near Elgin in Moray, Scotland. Burghead stands on the ancient site of Scotland's Pictish capital; a promontory looking out across the Moray Firth; an area renowned for its temperate climate and long hours of sunshine. There are numerous championship golf courses, stunning beaches, endless forest walks and scenic cycle routes. Moray is also home to many distilleries and is the heart of malt whisky country. Only 10 minutes from the market towns of Elgin and Forres, this self-catering holiday cottage provides ideal rental accommodation for golf holidays, fishing, or walking holidays; touring Moray, Grampian, NE Scotland and the Scottish Highlands; or for just enjoying the 7 miles of sandy beach that stretches between Burghead, Findhorn and Kinloss to the west and the 7 miles of rocks, pools and cliffs between Burghead, Hopeman and Lossiemouth to the east. The Moray Firth dolphins, porpoises and even basking sharks and whales can often be seen off the Burghead headland, or get closer to the action and head out to sea on a boat trip. Taigh-togalach is a long-established self-catering holiday cottage which provides clean and comfortable accommodation and has become a favourite home-from-home for a number of regular visitors to Burghead. We prefer to deal with you directly, so you won't find us on Booking.com, TripAdvisor, Airbnb or any other 3rd party accommodation websites. Check our availability early to avoid disappointment. Birds of Burghead, Moray & Nairn - find out everything to do with birds and birding in Burghead, Moray and Nairn. North 58º Sea Adventures - get out on to the Moray Firth from Findhorn and experience the thrills of an exhilarating high speed trip into the North Sea or a scenic tour of the coastline with the chance of a close encounter with some of the incredible marine life. Google - if all else fails.